In 1949, my Grandpa and his brother opened a small Scottish butcher shop, pursuing their dream of owning a business in Detroit, a prosperous city full of more opportunity than their native Windsor, Ontario. Their objective was to offer the highest quality, fresh-cut meats and superior customer service to the local Scots in the neighborhood. They sold the hand-ground Scottish meats including haggis, beef bangers, and black pudding, reminiscent of the ones they shared in their youth with their Scottish parents. Since they were already hand-grinding the meat and receiving overwhelming requests from their Scottish customer base to make and sell traditional Scottish meat pies, it made sense to develop the bakery side of the business. Grandpa began to test different meat pie recipes and techniques by using his own taste and sampling different iterations with customers from the “old country”. Creating the pie shell was the most challenging aspect for him, but he found his answer by shaping the dough over mason jars and allowing them to air dry in his basement for a few days, 48 at a time, since that was all of the space he had in which to work. Once the shells were dry, he would take them to the bakery where he would fill with them with meat and spices, bake, and sell them as soon as they came out of the oven. Then it was back to the basement with dough-covered mason jars. This process was certainly limiting, since the demand was high for the pies. Grandpa knew he needed to increase the supply, so he had an electric pie shell machine maker shipped from Scotland to Detroit, changing the shape of the business. They went from yielding four dozen meat pies to 72 dozen in one batch. Over the next year, they developed recipes for other traditional Scottish savory fare such as steak pies, bridies, and sausage rolls. After those were perfected, they sensed that something sweet was missing. As if the timing was orchestrated by fate, along came John Lindsay, the brother of one of their Scottish employees, a Master Baker on a short visit from Scotland. My Great Uncle and Grandpa hired him to share his traditional recipes and methods for making shortbread, fern cakes, and a variety of other tea cakes from scratch. The new sweets were yet another successful endeavor for Ackroyd’s Scottish Bakery. Like any child who looks up to his parents and their work, my dad saw the bakery not only as a business, but also as a family tradition – a tradition that could sustain its success while raising his family. Throughout his childhood, during weekends, summers and holiday breaks, my dad worked at the bakery with his Dad and Uncle. After his four years studying Hospitality Management at Michigan State University, he worked full time as a manager, continuing the Ackroyd tradition of providing traditional Scottish delicacies and treats to a satisfied customer base in Metro Detroit. I grew up working at the bakery most of my life as well. I, however, did not come to the same realization as my Dad had after college. After I graduated from Michigan State in Supply Chain Management, I moved out of Michigan. It took me over seven years to realize the bakery, which by then had become a local tradition, was really where I wanted to work and to continue my career. In 2009, I moved home and joined my Dad in the family business. Currently, my Dad and I manage the daily sales and operations alongside a tremendous dedicated team. We are excited about the future. Our bakery has been operating for close to 70 years; the goal is to last another 70. 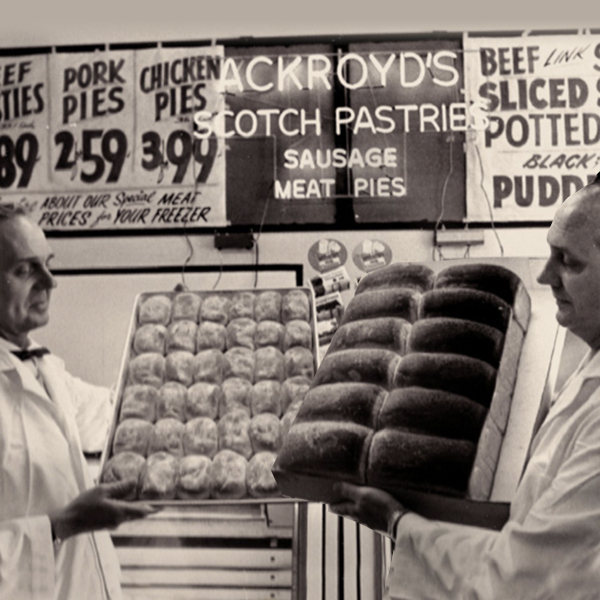 With planning an expansion both locally and online, bringing in exciting new products, and continuing to produce incredible Scottish fare, we hope that Ackroyd’s will be a part of your family tradition for decades to come.